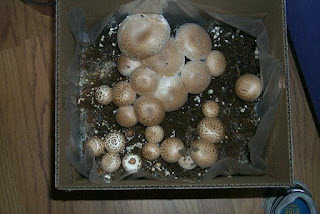 Back in 2005, I grew a bunch of portabella mushrooms. Mmmm. Tasty fungus. The little buggers grew so fast that I should have done a time lapse on them. Last summer, I got another wild hair and decided to grow shrooms again. No, dinglefoot, not that kind of shrooms, though I am sure there are a handful growing in the pasture across the road. I bought some shitake spores. They come as hardwood plugs impregnated with mushroom spores. Then you take a fresh oak log, drill holes all in it, hammer in the plugs and seal it with wax. I was not expecting any notable crop until spring. What's that? A delicious baby fungus? Leave the logs on the ground so they can absorb moisture. More 'shrooms assured. Place logs in a shaded area and keep moist. Elevating the logs from the surface, creating stacks, or leaning against each other for support is best. Frequent and normal rainfall should keep them moist, but the logs may require a watering during dry spells. If the logs receive no notable rain for two weeks we recommend soaking them overnight in a tub or bucket filled with water.